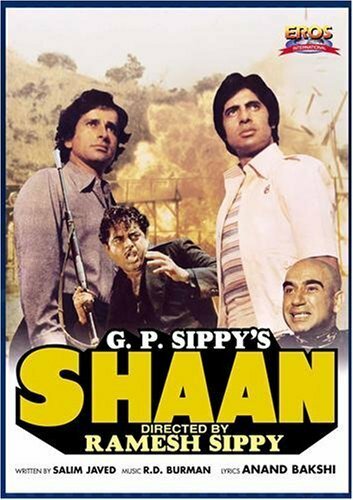 Description: Shaan tells the story of DCP Shiv Kumar an honest, brave and upright police man. He live in the country with his wife, a daughter and two brothers Ravi and Vijay who are con men to the highest extent and would do anything to th rick people, there cunningness, one day got them into trouble with the law where there brother was forced to arrest them and feel no pity for them. However they were release a few days later since they were keeping a low profile in jail. Shiv Kumar decides to investigate against gangster and smuggler Shakal and his men where he was killed in his line of duty. After there brother's death Ravi and Vijay decides to mend there ways where they were persuade by marksman, circus master and an old enemy of Shiv, Rakesh, who decides to mend his ways and join hand with the two legendary to destroy Shakal who keeps a man-eating crocodile on an island far apart.Shaan tells the story of DCP Shiv Kumar an honest, brave and upright police man. He live in the country with his wife, a daughter and two brothers Ravi and Vijay who are con men to the highest extent and would do anything to th rick people, there cunningness, one day got them into trouble with the law where there brother was forced to arrest them and feel no pity for them. However they were release a few days later since they were keeping a low profile in jail. Shiv Kumar decides to investigate against gangster and smuggler Shakal and his men where he was killed in his line of duty. After there brother's death Ravi and Vijay decides to mend there ways where they were persuade by marksman, circus master and an old enemy of Shiv, Rakesh, who decides to mend his ways and join hand with the two legendary to destroy Shakal who keeps a man-eating crocodile on an island far apart.